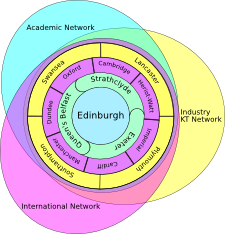 In the third phase, the core consortium now consists of the University of Edinburgh, the University of Strathclyde, Queen’s University Belfast and the University of Exeter. The consortium includes the associate universities of Cambridge, Cardiff, Dundee, Heriot-Watt, Imperial, Lancaster, Manchester, Plymouth, Swansea, Oxford and Southampton. To conduct world-class fundamental and applied research that assists the marine energy sector in the UK to reliably and dependably accelerate deployment rates and ensure sustained growth in generating capacity to meet the 2020 targets. To expand and effectively operate an inclusive network of academic researchers, industry partners and international collaborators. To continue to provide the highest quality of doctoral training and knowledge transfer in partnership with industry to build intellectual and human capacity for the sector. Prof. Robin Wallace PI, Executive Director, Financial Management. Prof. Ian Bryden Research Director, with responsibility for technology and R&D foresighting. Prof. David Ingram Doctoral Training Manager, with responsibility for EU liaison. Mr. Henry Jeffrey Marine Network Manager, industrial liaison, and road-mapping. Prof. Trevor Whittaker Natural Environment & Deployment Infrastructure, Ireland and Wales liaison. Mr. Cameron Johnstone Knowledge Exchange, Economic Interface, Scotland liaison. The Marine Energy Network is open-access and includes academic, industry and international partners, whilst continuation of the Research Advisory Forum (RAF) will provide formal feedback, input and steerage. The international network will develop and formalise relationships with regions including Europe, the Americas and Asia. The industry network includes existing collaborators and is open to all interested and committed device and component manufacturers, developers, utilities, agencies, regulatory bodies and government departments. It works in close collaboration with the Energy Generation and Supply Knowledge Transfer Network. The academic network includes staff with research interests in or related to marine energy from university and HE colleges that are not already core or associate members. The international network includes all interested and committed researchers from outside the UK that are in a position to engage with the work of the centre. There are identified academics or industry partners in countries including the USA, Canada, Taiwan, China, Japan, Hong Kong, Korea, France, Spain, Germany, Ireland, Norway and Portugal. Doctoral training continues across core universities, associate universities and industry partners in a programme coordinated by the management team in conjunction with the Industrial Doctoral Centre in Offshore Renewable Energy (IDCORE) which is operated by the centre (see http://www.idcore.ac.uk/ for more details). Additionally, as in Phase 2, eight residential training schools are planned, each covering a distinct aspect of marine energy. Coordinated by the DTP manager, courses will be delivered by experts drawn from the academic, industrial and international parts of the network. These schools will be open to any other UK doctoral students in marine energy and their supervisors, additionally to all network members. CPD credits will be awarded to participants. The marine renewable industry has developed road maps, including those published by the ETI & UKERC. These have highlighted issues posing significant challenges that may hinder or delay the development of an economically viable industry, including: predictability; manufacturability; instability; operability; survivability; reliability and affordability. These all require complementary development of new industrial applications and underpinning research, where there are gaps in the necessary knowledge. The following initial themes, as examples, follow a gap analysis conducted over the roadmaps and developer issues against currently funded research programmes. This dynamic mapping process will continue throughout the project, building on an evolving appreciation of the issues and needs, fed back through the industrial network members. The research staff in Phase 3 will operate flexibly to establish pathways to solve these and other challenges identified across the sector, and to work in partnership with industry collaborators to raise additional funds and deliver the necessary research outcomes. In the summers of 2011, 2012 and 2015 the SuperGen UK Centre for Marine Energy Research placed three £3 million research funding calls commissioning nationally leading researchers to investigate key questions for the present and future of marine energy. These three calls have led to the funding of 16 new research projects managed by the UKCMER hub. Details of the calls and the projects funded through them are available here.